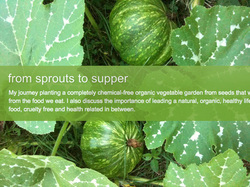 This all started because of the from sprouts to supper blog which was born at the end of Feb 2010. At the time I was starting a lot of seeds indoors for my vegetable garden and my friend suggested that I blog about the progress. The vegetable seeds didn't do so great as you can see here, but the seed for health and wellness and everything in between was planted and a passion for health, wellness and clean living was ignited. what do you need to love supporting a healthy lifestyle? I support healthy food choices including organics and genetically modified (GMO) free products and am always on the search for safer beauty products and household cleaners. I can no longer keep it all to myself. Based on that passion I decided to become a health and wellness consultant - sharing ways to improve health and home and fulfilling my dream for a health based business that does the right thing. I've always been interested in healthy living and found myself getting more into it after switching to a whole food plant-based diet. I also stared gardening at around the same time so that piqued my interest in growing my own food, organics and sustainability. I am a graduate of the Institute for Integrative Nutrition® and have a certificate in Plant-Based Nutrition from eCornell. I am also a Dietetic Technician, Registered (DTR). My DTR credential ensures that I make evidence-based recommendations. At the Institute for Integrated Nutrition® I learned about more than one hundred dietary theories and a variety of practical lifestyle coaching methods. Drawing on this knowledge, I help my clients create a completely personalized “roadmap to health” that suits their unique body, lifestyle, preferences, and goals. The Plant-Based Nutrition certificate from eCornell allows me to use a science-based approach to nutrition that can dramatically reduce your risk of cancer, diabetes, heart disease, and obesity and improve your quality of life. Learn more about my training and my unique approach to health coaching. Are you or someone you care about curious about how health coaching can help? Let’s talk. Schedule an initial consultation with me today!